Among the many things to admire about the youth who led the March for Our Lives events this past week is their patriotism. That may sound a little off because their detractors have gone to some lengths to question that very thing. But the reality is, they were acting on the very lessons taught to us all about what it is to be Americans: stand up for what’s right, encourage participation in our democratic system, communicate with your representatives, strive to make your country a better place. 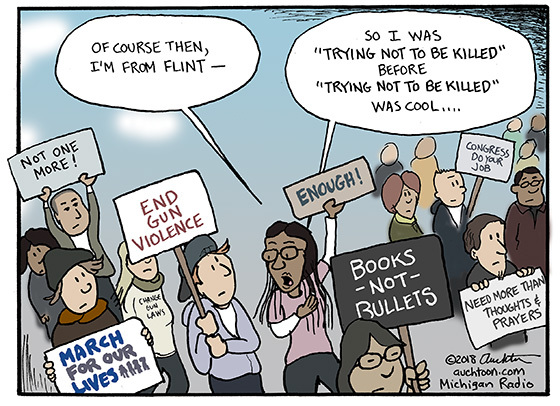 And what awful and compelling stories they had to tell about gun violence — the same stories kids from places like Flint have been telling for too long. That definitely needs to be part of the bigger conversation. And yet, with the news this week of Ford Motor Company looking to purchase the Michigan Central Station building and property in Detroit, I find myself at an “Ob-La-Di, Ob-La-Da” level of McCartney sunshine (which is to say, sort of sickening). The Michigan Central Station is an architectural marvel. But where once it was a majestic point of entry to a thriving Motor City, it now has sat derelict for 30 years as an albatross and an eyesore. Now I hear all you Lennons out there, “Ford is only doing it for the PR.” “It’s all about profit.” “It’s just further gentrification that doesn’t help the people of Detroit.” I get that. But you know, sometimes the two sides can coexist. Sometimes Lennon and McCartney work together to make a pretty good song. Each section (or “house”) of the dormitory had a team. So other than my roommate (who was friend from high school), my teammates were basically randomly selected by the universe. This was fine except for one guy — he was one of our better players and nice enough to everybody on our team, but he would go out of his way to hurt players on other teams. During games I would, of course, support and defend him when the other team got angry at him. That’s what teammates do. And outside of games when somebody from another team would see me on campus and say, “Hey, what’s the deal with that guy?,” I’d make excuses, “Well, he’s good player, he’s just a little intense.” But after awhile, that wore thin. The truth was, he was not a good person. Probably a sadist. I still feel bad that I defended him. 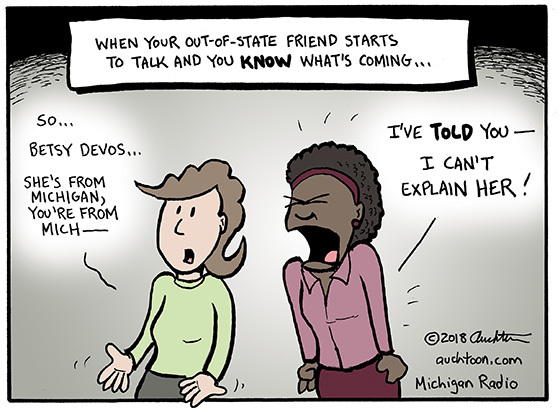 So here we find ourselves with Betsy DeVos, randomly selected by the universe to be on our state of Michigan team. You saw her performance earlier this week on 60 Minutes. You saw her performance at her confirmation hearings. You’ve seen her performance as Secretary of Education. I cannot explain or excuse any of that. Being a “member of our team” by geography or even “on our side” politically makes some sense, but it really should be a secondary consideration. At some point a lack of competence has to be the more important consideration. At some point the indefensible must actually, you know, not be defended. Next week, March 11–17, is Sunshine Week. 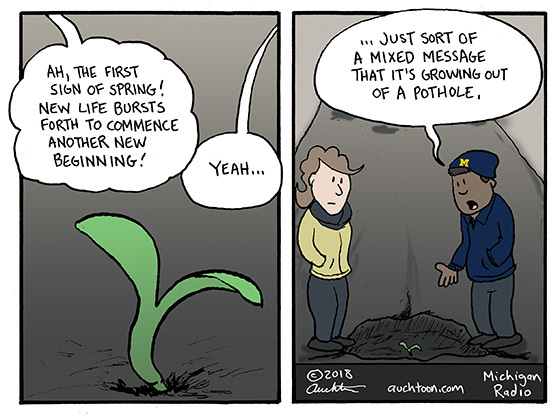 For us Michiganders, the timing may seem a little off. It is squarely in the hopeless stage of our long, gray winter — what’s this talk of “sunshine”? That’s just mean. And certainly, when another state makes a play to draw a significant amount of Great Lakes water to outside of the Great Lakes basin, we have the right to know. Thank goodness we do know because the Scott Walkers of the world have proven over and over they are not inclined toward full disclosure. It’s not in their best interest (and their best interest is typically their only interest). To be fair, Wisconsin is not the only state challenged by balancing economic development with environmental protection. We in Michigan are always grappling with how best to take care of our most valuable natural resource — fresh water: Should we let Nestle expand its bottled water operation? Should we allow a new potash mine to draw millions of gallons of groundwater? Plus, it’s not like Michigan hasn’t gone down the dicey tax break path with solar panel manufacturing and batteries for electric cars. 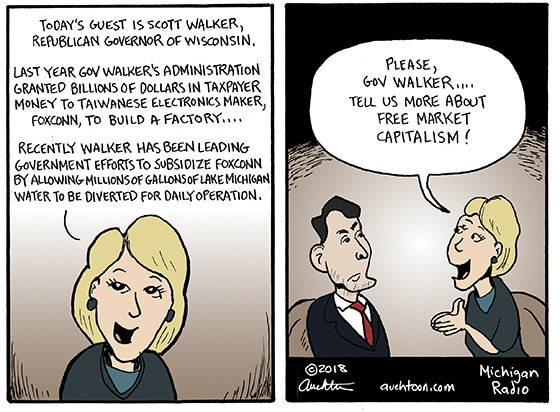 Truth be told, our own free market capitalist GOP governor made a “government picks the winners and losers” bid at Foxconn. But Walker and Wisconsin way outbid us. Way outbid. One could even say absurdly outbid. So let ’em have it. We’ll see how viable LED screen manufacturing is in 25 years when their investment is scheduled to begin paying off. But let’s be suspicious about diverting water outside the Great Lakes basin to do it. Let the sun shine so we know what’s going on. Ridiculous, right? But it reveals just how ridiculous it is to enthusiastically abuse anything. And how ridiculous it is to put a positive spin on something that is killing you. So what’s the connection to the cartoon? Well, it’s that particular lyric that inspired me to think: The United States as a country continues to suffer death and injury at an unacceptable level from gun violence and opioid abuse. Why? Why if both are clearly killing people have we in the recent past allowed the doubling-down on their use? It seems so obviously counterintuitive. Especially when other countries have found better methods. 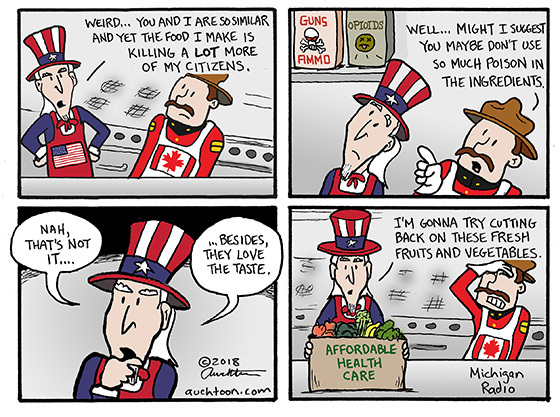 Yes, all countries are unique, but Canada is very, very similar to the United States. Why is their gun violence rate so much lower? Why is their level of opioid abuse (while still unhealthy) significantly less? Until we get truly serious — which means sensible solutions to reduce availability and use — we’re kinda drinking bleach.